Del Mar gets update on plans to remove train tracks from bluffs. 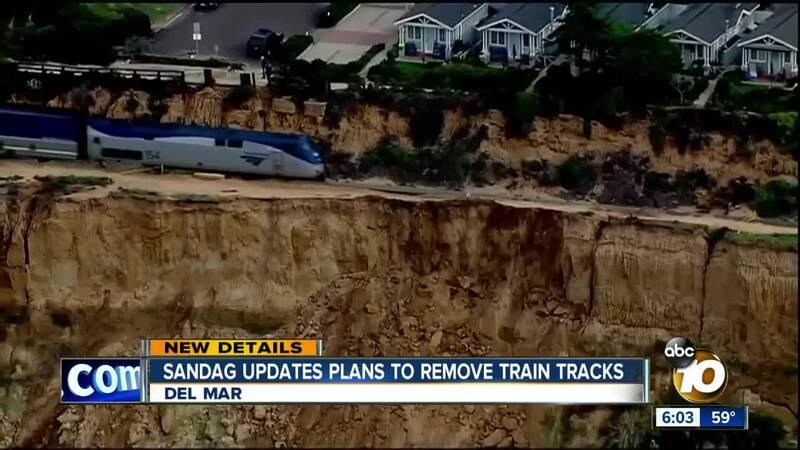 SAN DIEGO (KGTV) -- People in San Diego's North County are learning more about long term plans to remove the train tracks over the bluffs in Del Mar. Monday evening, SANDAG updated the Del Mar City Council on efforts to stabilize the bluffs and work towards removing the tracks and building a tunnel through the area. Frank Stonebanks is part of a grassroots effort fighting to have the tracks removed. "I think it's about safety and access. There have been no fewer than six bluff failures in the last 3 or 4 months. Each one is getting worse over time. We have had a great deal of rain and wind and storm over the last several weeks, so I think that just causes a lot of concern that potentially the tracks could just fall right off into the ocean," said Stonebanks. Transportation officials continue working to secure the bluffs. "The reason that you don't see a lot of that action is because over the past 15 years those bluffs have been protected by burying three foot diameter columns about every 10 to 15 feet into the ground, closer to the tracks," said Jim Linthicum, Director of Mobility Management for SANDAG. The next project involves improving drainage. "Instead of soldier piles, we're going to be protecting it from drainage, both drainage up near the tracks and the wave action down near the beach," said Linthicum. The 40 year regional plan is to move the train tracks inland and build a tunnel. Monday evening, the council learned of 5 possible "re-alignments" where the tunnel would be built. The estimated cost of moving the tracks is roughly 3 billion dollars and funding hasn't been secured. "This is a very expensive project. This is a multi- billion dollar project and that kind of money isn't found in the sea cushions," said Linthicum. Stonebanks says that timeline needs to be accelerated. "I think for any practical person, who is involved with this stuff and they come to a hearing and they hear 2050, they just check out," said Stonebanks. City leaders pointed out that an average of 12 people are killed each year by trains through that stretch; whether it's suicide or accidental. While SANDAG works to come up with funding to move the tracks, stabilization efforts of the bluffs will continue.
" The most vulnerable areas have absolutely been protected and they've been protected over a series of projects over the past 15 years. We continue to cull together money to protect even more of them so that those tracks can stand there a long, long time," said Linthicum. In the meantime, SANDAG is reminding people to do their part to help prevent erosion. "Please stay off the tracks. Don't walk along the tracks. Not only isn't it safe, but by walking along the tracks and destroying some of the landscaping, the root structure to that landscaping is what holds the soil together," said Linthicum.